Our IP telephony solutions consolidates all office communications - IVR, conferencing, contact centre, instant messaging, fax and live chat - into a singular Unified Communications system, for greater ease of usage for your personnel and uninterrupted access to service for your customers. 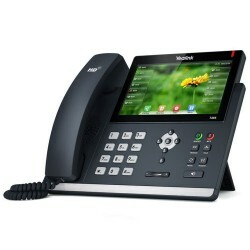 SIP-T19P1 VoIP account132x64-pixel graphical LCD2 x Lan portCall hold, mute, DNDOne-touch speed dial..
SIP-T21P2 VoIP account132x64-pixel graphical LCD with backlight2 x Lan portHD voiceCall hold, mute, ..
SIP-T23G3 VoIP account132X64-pixel graphical LCD2 x Gigabit Lan portSupport Dual colour LEDCall hold..
SIP-T29G16 VoIP account480x272-pixel graphical LCD2 x Gigabit Lan portBuilt-in USB port,support Blue..
SIP-T40P3 VoIP accounts132x64-pixel graphical LCDRevolutionary new design One-touch speed dial,..
SIP-T41P6 VoIP accounts One-touch speed dial, redial Call forward, call waiting, call tran..
SIP-T41S6 VoIP accounts One-touch speed dial, redial Call forward, call waiting Call ..
SIP-T42S12 VoIP accounts One-touch speed dial, redial Call forward, call waiting Call..
SIP-T46S16 VoIP accounts Call hold, mute, DND One-touch speed dial, hotline Call forw..
SIP-T48S16 VoIP accounts Call hold, mute, DND One-touch speed dial, hotline Call forw..
CP960Phone features 1 VoIP account Call hold, mute, DND, call recording, hotline 5..
W56HPhone features Up to 2 simultaneous calls per handset . Handset select for receiving cal..